The Baseball Pitcher Weather Vane featured here is handcrafted in copper with a brass hat, long sleeve shirt and pitcher’s mound. For brightness and contrast we used optional gold leafing on the pitcher’s face, hands and socks. Each of our weather vanes is custom made to order and we will modify the metal combination used to your preference. This sporting weathervane also features translucent glass eyes and, again, you get to choose whether your pitcher has blue, green or brown eyes. You can even provide us with photographs of your favorite baseball player (male or female) and we will create a portrait version of this weathervane for you or someone you know who is passionate about this sport! 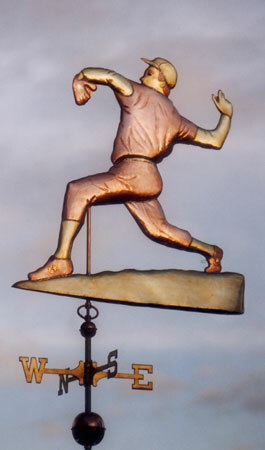 We also offer a Casey at the Bat Weather Vane, inspired by the famous baseball poem written by Ernest Thayer in 1888. Because baseball is such an important aspect of American culture that it has been featured in many films and books. Famous film adaptations include “Field of Dreams”, “The Natural” and “Moneyball”. Well known books include “The Boys of Summer”, “Shoeless Joe” and “The Art of Fielding”. Other team sport weathervanes offered here at West Coast Weather Vanes include Football, Soccer, Hockey, Polo Tennis and Crewing, to name but a few. It is generally agreed that modern baseball is a North American development based on the older game Rounders, although several references to ‘baseball’ have been found in English and American documents dating back to the early eighteenth century. The earliest known unambiguous American discussion of ‘baseball’ was published in a 1791 Pittsfield, Massachusetts statute that prohibited the playing of the game within 80 yards of the town’s new meeting house. Quite a different opinion about a game many now consider a classic national pastime, but very much of a time in which window glass was rare, precious and difficult to acquire!